Government scientists have claimed that North Sea and west coast cod is under threat from over-fishing and not climate change. The Fisheries Research Service (FRS) is warning that if cod fishing is not slowed, fisheries may have to depend on non-native species. However they insist that the seas are not in crisis and that cod stocks could be stabilised within six years. Last month fishing industry bodies agreed to cut fishing days by 14%. However some experts believe more drastic measures are needed with the International Council for the Exploration of the Sea (Ices) calling for a total ban for 2007. Last month the European Commission recommended that the number of cod fishing days was cut by 25%. 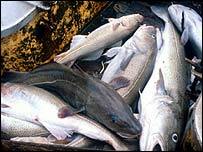 The FRS believe that if cod fishing is sufficiently slowed, it could continue to be a viable industry for 100 years. However the Scottish Fisherman's Federation has argued against "draconian cuts" to allowances, which it claims would have a devastating impact on the Scottish fleet.